With the Cricket World Cup beginning, the 'cricket fever' is on. Photo: Star File. So here we are, the fever is on! So here we are. Just about a week back, perhaps the most popular of competitive sports, cricket's world event has got going in this part of the world. This is not the first time though that the world cup is taking place in this region. But this is the first time that our dear homeland has been honoured to be the host to the inauguration of this great event. We are also going to host a number of important matches. This time on, fourteen cricketing nations are participating in this tournament. As they say, the pulsating 'cricket fever' is on. 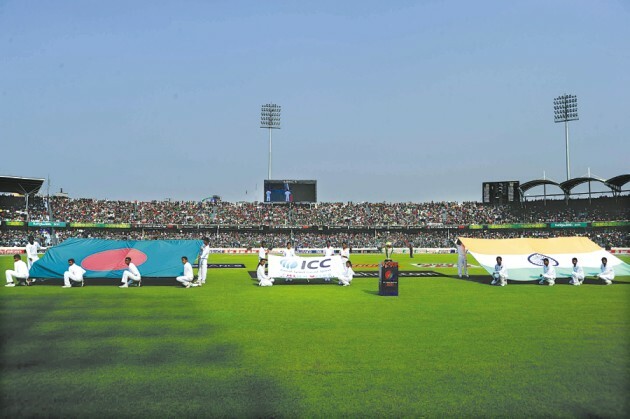 Bangladesh players prepare for the battle. Sri Lankan Batsman Mahela Jayawardene flicks a ball in the World Cup. In our younger days the proverbial 'cricket fever' used to be confined to India and Pakistan only. But now Sri Lanka and, more recently, Bangladesh has come into the fray. Who knows whether our other neighbours would join in the bandwagon soon? Some people despise cricket. I haven't a clue why. The other day a colleague of mine, obviously a cricket hater, announced in a party situation that only the people who had nothing to do, like playing or watching cricket. It is a colossal waste of time. I do not see why any body should describe cricket as a waste of time when a file from one desk in a government office takes more than a week to travel to the next! This argument of mine was once challenged by a friend who said, “It takes more than the 'time' you have talked about. It takes the envelop to pass under the table as well”. Be that as it may, cricket for me is a passion. I had tried to become a cricketer and failed, because my father wouldn't let me be one. His logic was simple. He said I couldn't make a living off cricket. In those days professional cricket in the present form was an unknown phenomenon. So I took to commentating on cricket with my little knowledge of the game fortified, of course, by the Wisden year book. But my commentating used to be confined to the 'Dhupkhola math', our play ground for the most important fourteen years of my life. I used to roll a book to resemble a microphone and commentate on almost any and every game of 'importance' that was played in that field.